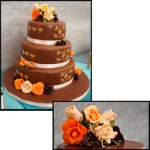 Specialist cake maker with a focus on high-quality Wedding Cakes, although provide cakes for all occasions. I use top quality locally sourced produce, from the flour to the butter and eggs, all from Tamar Valley producers, and use only the finest Belgium chocolate. Cookery courses – Get adventurous, get more involved and save some money, how about making your own Wedding Cake? Learn to make your own cake over the course of a weekend with professional tuition and guidance. I can help you with the recipe of your choice and how best to bake it and then learn how to ice your cake and make a range of sugar icing decorations from scratch.